Less than 1 GB of RAM may have difficulty processing maps/memory issues. May not be supported on Android devices with an Intel Processor. 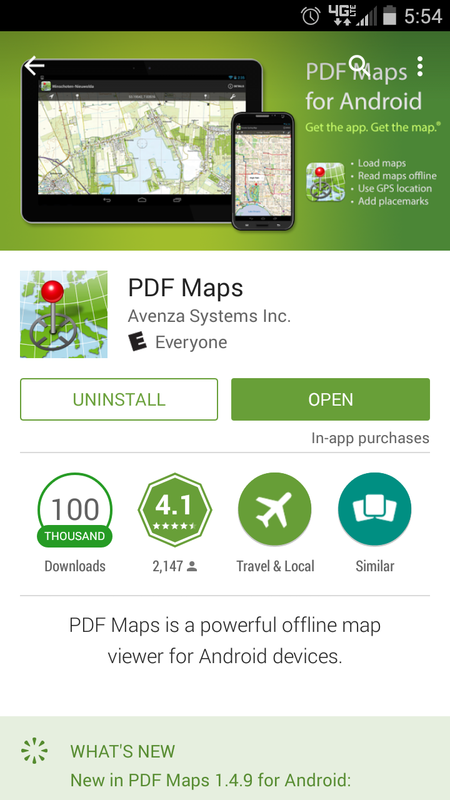 The PDF Maps App is available by searching for Avenza PDF Maps or PDF Maps an app or play store. This app has access to free and for purchase worldwide maps. In a nutshell the PDF Maps App has the ability to view various types of maps, research areas, create tracks, placemarks, take photos, determine map area distance, and much more. The install of the PDF Maps App was quick and easy. 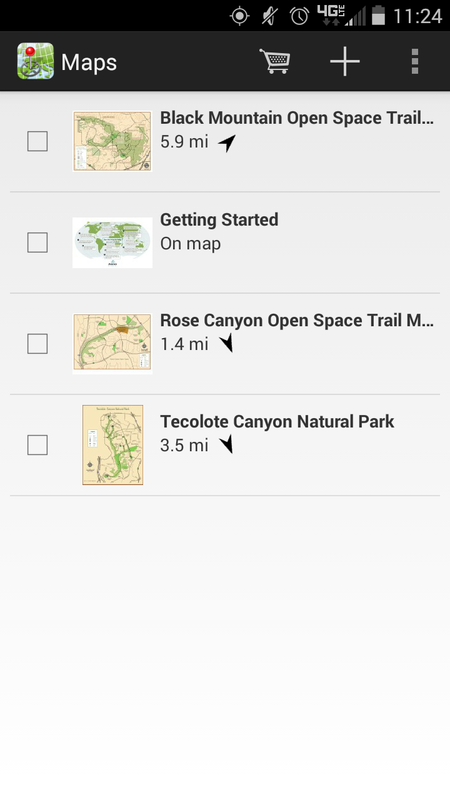 I created a user account from the app that I can purchase maps as needed. 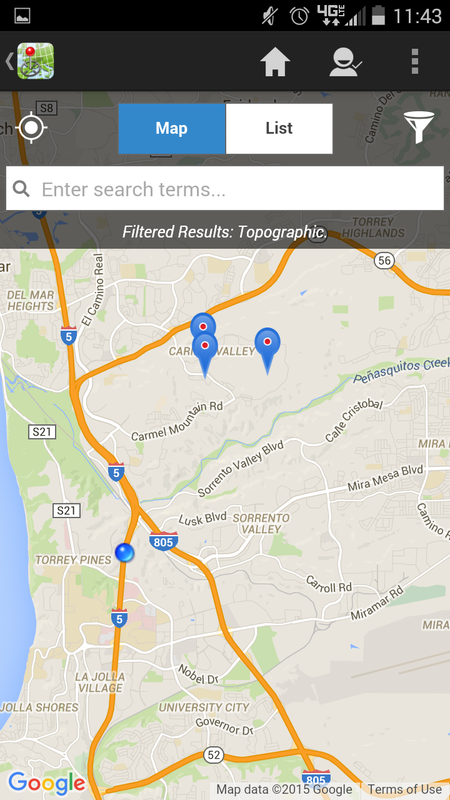 A nice feature of this app is the maps can be purchased and loaded directly. 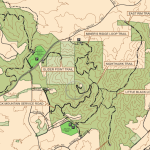 Thus far I have downloaded three free maps for local hiking areas and trails. 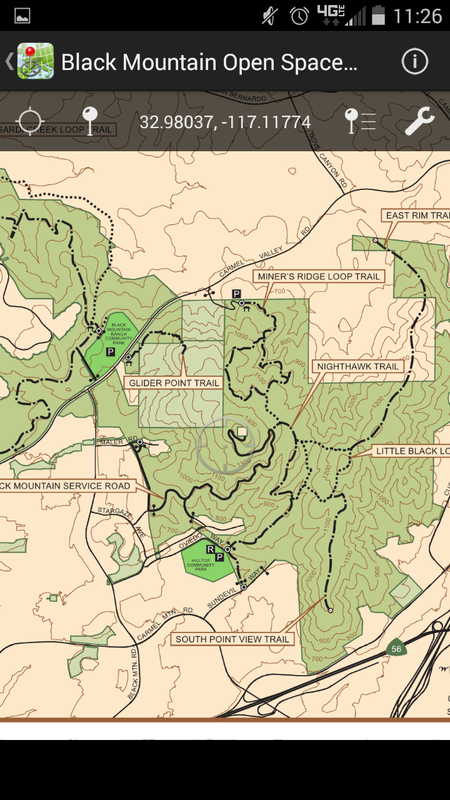 I have been to two of these forested areas and I was curious if I could identify some familiar trails on the maps. The downloaded maps for these areas feature main roads around the parks, some trail names, parking, restrooms, trail indicators, and a map key. The maps only indicated some of the trail names; which was a little disappointing, but the trails listed were familiar to me. There is a getting started map (already loaded) that has information on the various features of this app and directions for use. The directions appear clear and straightforward. The app symbols are listed with instructions of how to use the features and/or an explanation. 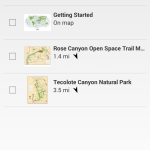 According to the getting started map this app allows placemarks (photos, text) to be added and then can be organized in folders and imported and exported to KML, GPX, CSV. Some additional features include: compass to view direction, track current position, purchase maps, zoom in and out, zoom and center. The map tools icon has the ability to find by coordinates, find place, plot photos, record GPS tracks, measure distance of an area, and open view in Google Maps. There are a wide variety of maps available: National Park Maps, USGS and Canadian Topographic maps, nautical and marine navigation (NOAA and FAA charts) for North America and other regions, tourist maps, transit maps, historic maps, and general travel maps. 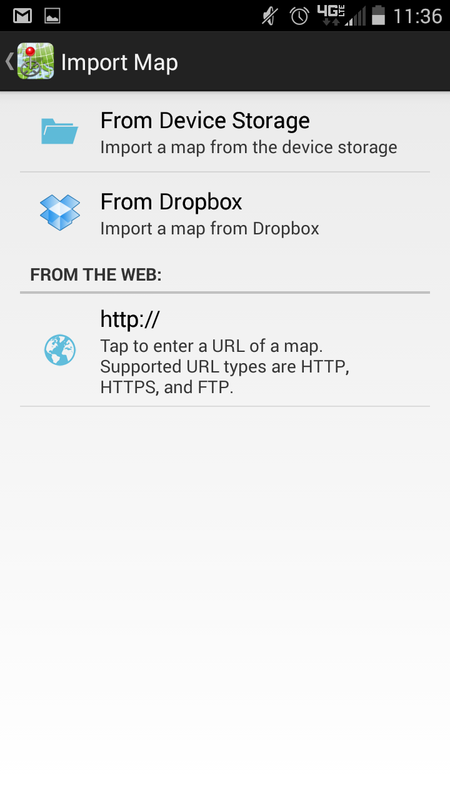 The maps that are stored on the device/phone can be accessed without an Internet connection. This is a great feature to prevent data charges, save battery usage, and to have map access where no data service is available. I browsed through the maps near my location and I was shocked how many appeared in the list and the various types. Many of the maps available were surprisingly free. It is going to take me some time to peruse through what is available and what is best for me to use in the wilderness and in my areas of interest. 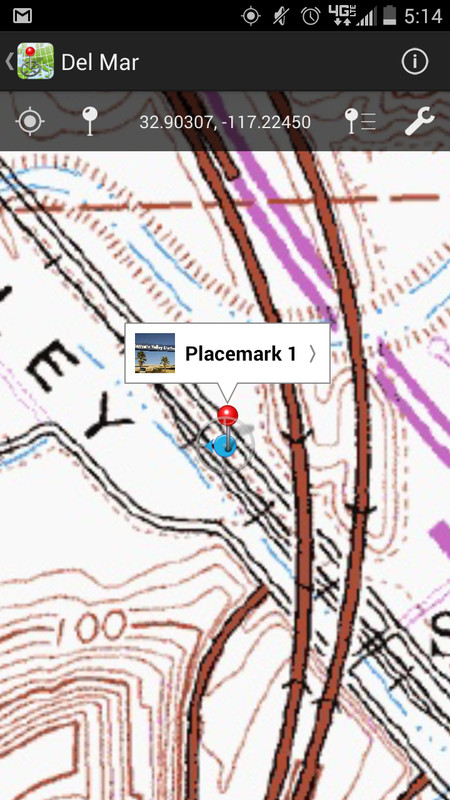 I found it easier to load the list of available maps than to open the placemarks on the map. 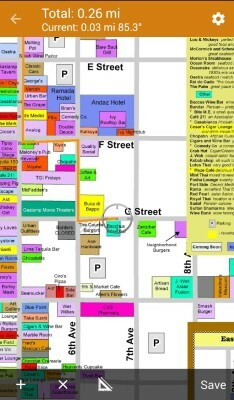 Plus the list gives a detailed description of all the maps and features in an easy to read format. I found some California regional maps that I am interested in purchasing. When I select a map from the list that I am interested a full description appears with the map date and upload date. The map can be purchased direct and the payment gets pushed through my Google Play account. I have much to explore with the PDF Maps App. So far I have explored how to download maps, view maps, set a placeholder, and find my location on a map and then switch to a Google Map view of the same region. 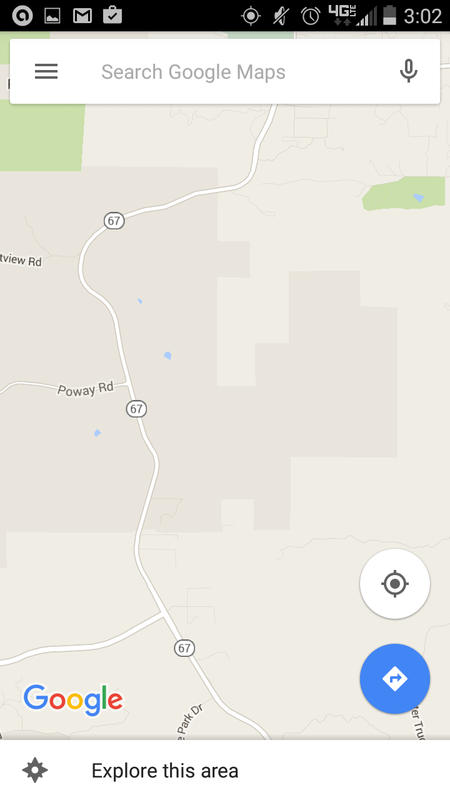 At my work I am noticing that my location is being displayed on the app and in Google Maps about ¼ mile off. My precise location is off; however the blue circle indicating my approximate range is accurate. However, away from the buildings of my work the app and the Google Map view is precisely accurate. I will definitely have to explore this more. 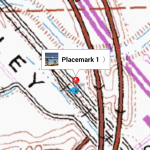 I find it fascinating that my general location can be identified on the PDF maps in the app. When I displayed a map outside my current location I was notified that I was not in the map location when I attempted to locate myself. I noticed in the map list the distance from the current location or if the location can be viewed on the available map is indicated. I will be busy the next month checking out all the features of this app around town, in the wilderness, and for planning purposes. 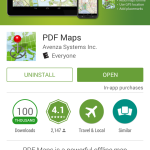 Check out the PDF Maps App 2.6 in your app store or here www.avenza.com/pdf-maps . Over the past month I have been trying out the PDF Maps App 2.6. So far I have used the app on three hikes and for exploring future hiking areas. The app has always been easy to load and never crashed. I really like the ability to record my hikes, see the total miles traveled, view graphs of speed and elevation, and add pictures and notes to my hikes. This makes keeping a hiking log easy. 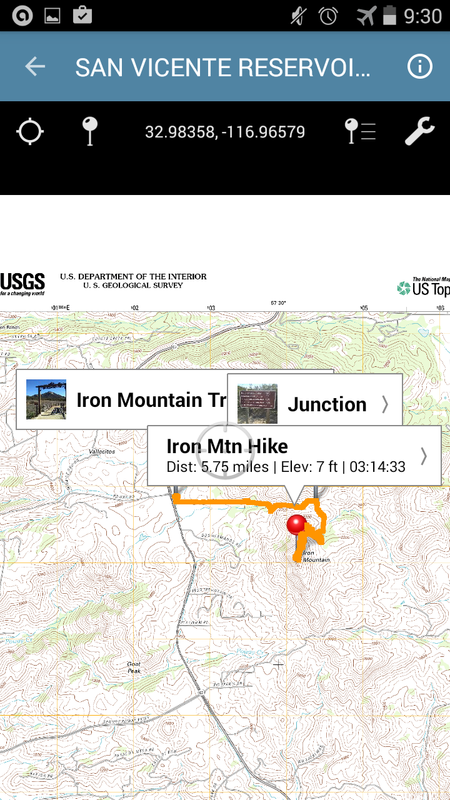 On a group hike recently I shared the data tracked from my hike with the PDF Maps App 2.6. This was a nice addition to future planning of this same hike and made the presentation of the screen copy more interesting with the photos. The group is planning to add this information to the event description when they announce the same hike in the future. There are a few things I am trying to still figure out with the PDF Maps App. I can record the hikes I completed, but I can only view them on the map when I load the map. 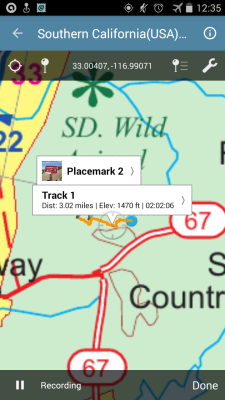 I wish there was the ability to see the recorded hikes and be able to access the hike details (maps and graph) from a list with no need to search through maps for the recorded track or placeholders. I am thinking the more hikes I record the more difficult it may be to locate them in the future. I also noticed that if I use the Open View in Google Maps feature my recorded track does not appear on the Google Map. I just assumed it would appear on the Google Map since it was already recorded on the main map and in the window view. Also I am still trying to figure out the elevation profile. 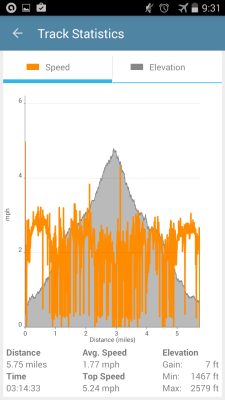 The profile graphs the speed and elevation of the recorded hike. It also lists the total hiking time, average speed, top speed, and elevation gain/min/max. I am confused with the elevation gain. I am assuming that this program figures the total climbing elevation and when descending it subtracts the descent. So the only way I would be able to see my total gain would be to subtract the minimum from the maximum elevation. I still have to look at this a bit more. I found the mileage and the total hiking time right on. Between two GPS recording programs the speeds were almost identical and the elevation was varies between the programs by 200 ft. I find that if I compare any program the elevation and speed always have discrepancies between them. I recorded all my hikes in airplane mode so my data was turned off on my phone. After a hike last just over three hours my phone battery was at 60%. That would be adequate for the current length of my hikes. I also carry a backup battery with me so I do not figure running out of battery power when on the trail. I am wondering what happens to the recording if the phone is turned off (Is it partially saved?). I will explore this while turning off my phone during the recording. It seems like my GPS location in the building I work in is a tad off in every location or map program by about .5 mile, but, this is not happening consistently. I also noticed that the “off” GPS coordinate is in the same location each time. I like the variety of maps that are available in the PDF Maps App and the ease of downloading the maps. Many wilderness areas are available, actually there is not an area that I was interested in that I could not find. The only issue I am having when finding maps is I am downloading the incorrect map at times since I am not familiar with the area and do not know before downloading all the map details. I have been previewing prior to download but I ended up downloading a neighboring map. If I am in the area I wish to download it makes it easy (but at times data service may not be available to do this) to identify what maps are available as the app lists what maps are available in that area. 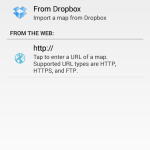 It has been just over a month since my last update on the PDF Maps App 2.6. I used some of the maps for exploration and to give me ideas on future hikes near home and work. Also the maps gave me some tourist ideas in local cities and future planned trips. I have been using the Rose Canyon and Tecolote Canyon maps frequently for exploring the hiking trails near my work. I also utilized the Black Mountain Open Space Trail Map to look at some mountain bike trails that I am interested in riding in the future. 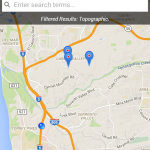 I utilized the San Diego Transit Map as I typically take the train and the shuttle to work. This map came in handy when my shuttle was late and I needed to find a city bus to get to the train. It showed me the route number of the bus near my location and the exact location of that stop. I then loaded Google Maps to give me walking directions. That is one downside to the PDF Maps App as Google Maps needs to be opened for directions. It is easy to do since there is an option to open Google Maps. However, if there is no Internet service one must rely on map reading skills. There are just so many maps that are free to download; the list seems endless. Mostly all the maps I was interested were available free of charge. Even with the paid maps the preview zoomed in enough that I could get some detail, especially on the National Geographic Maps. When searching for available maps in my location I noticed that when I selected the map title for more information the detailed map information was listed along with an option to preview the map. I noticed that even if I already previously downloaded the map there was still an option for me to download the same map. It would be nice to have the ability to download the map deactivated if the map is already downloaded. I utilized the San Luis Ray Topographic Map twice to record a hike at the hiking trails that are near my home. 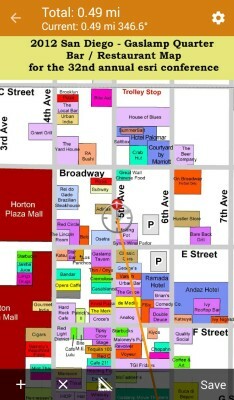 This map had some basic topographic features and city streets were also listed. I was unfamiliar with the area so recording the hike was good in the essence that I could easily backtrack by looking at the recording while I was hiking. There was not much elevation gain in this area not more than 200 feet. So it was not a good hike for me to determine how this program actually calculates and presents elevation gain. It was fun though to record my hikes in this area that was new to me and add pictures of the trails. I specifically made it a point on a recent 6-mile hike to see how the elevation is calculated when it is recorded. I was close to an area that I visited before and I was uncertain where exactly the hike started and ended from looking at Internet maps. I arrived at the hiking location to find that the map I wanted to use was .2 miles away from where I was located at the starting point. But, later it would have been available due to the route of the hike. I was disappointed, but I did not want to start a recording then switch to another map and continue recording. So I opted to use a Southern California general map that was loaded in my phone without any topographic features or any details. Also I was not able to load the map I would need at the location because my data connection was not strong. Anyway I was still able to make placemarks, add photos, and record the hike. After just over 3-miles of climbing at our turn around point I check the elevation gain on the recorded hike. At the turn around point 1470 ft. of elevation gain was recorded. Which is pretty accurate from data gathered by others and posted on the Internet. The mileage also seemed pretty accurate. Now at the conclusion of the hike at the same start point the elevation read -10 ft. So the true elevation gain of the hike is not recorded separately (I had to remember to look at the summit) it is combined with the descent so the loss is deducted from the gain. I would like to be able to see the total ascent and total descent not just one number that deducts descent from ascent. Also on this hike I noticed that the battery life of my phone (in airplane mode) was at 62% after just over four hours of hiking and taking pictures. Look at the elevation at my turn around point. Complete hike. Notice the elevation reading. 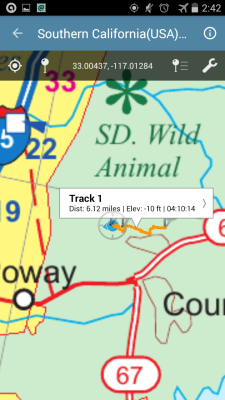 There is a feature in the app to determine distance from point to point. This can be drawn as an aerial straight line or using various angles (as to measure city streets). The distance can also be displayed in various formats (miles, feet, kilometers, etc.). I found this to come in handy to measure point-to-point distance. No placemark is needed to use this feature. So I was curious before to see if my phone battery ran out of juice if my hike or walk would still be recorded. And I am happy to say yes it is. The App saves the recording that was interrupted along with the mileage and elevation. I still think the PDF Maps App 2.6 is handy since there are so many maps available at just a few screen touches. And many of them are free or under $3.00. Even with the more expensive maps it is still easier to obtain the map instantly than driving to a store to purchase the same map. There are so many great features of the PDF Maps App 2.6. 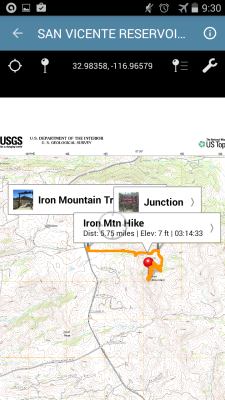 I really like that I can record my hikes and add pictures and notes. Also the convenience of having so many maps available is great. Also when used in airplane mode there is plenty of phone battery life remaining after a long hike; even while snapping some photos. The only thing that bugs me about this app is the way the elevation gain is calculated for the recorded walks/hikes. Maybe this is something that can be enhanced. I will still continue to use this App, as it is a pretty nifty and informative tool.